This past January, I went on a weekend ski trip with a group of friends to Sugarbush Resort in Warren, VT. While we were eating lunch—a classic spread of PB&Js, salt-and-vinegar chips and apples—my friend pointed out a name written between the trees on the mountain trail map hanging above our table. He said he’d heard somewhere that one guy hand-paints “like, all the ski maps.” I was intrigued. Throughout the last five decades, just a few artists—including Hal Shelton in the ’70s and Bill Brown in the ’80s—have done what Niehues does. 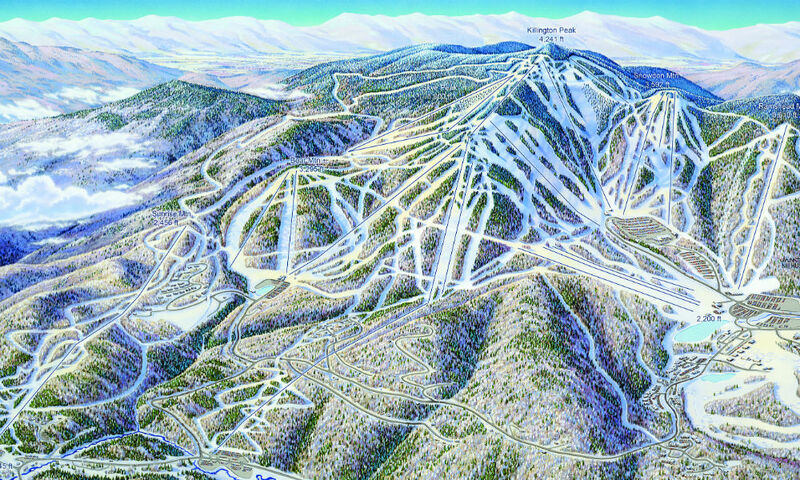 In the ’90s, ski resorts turned to computers to create their trail maps—Gary Milliken, for example, who invented the digital map system VistaMap, produced Gore Mountain’s map. Ironically, though, in recent years, resorts have gone back to favoring hand-painted maps, the likes of which, really, only Niehues can produce. Niehues, though now semi-retired, is working on the map for Mt. Bachelor in Oregon, an exceptionally challenging project, given the fact that the resort’s trails cover the entire 360-degree span of the mountain. “They’ve always had more than two views to show all their terrain, but now I’ve included everything into one view,” he says. Unsurprisingly, I’m not the only one fascinated by Niehues’ work. Skiers Todd Bennett and Ben Farrow had the same “aha!” moment I had when they spotted Niehues’ name on the map at Idaho’s Tamarack Resort in 2017. “I’m basically a fanboy,” says Bennett, who reached out to the artist soon after. “I told him that I’d like to buy his coffee-table book, and if he didn’t already have one, I’d like to make him one.” Niehues didn’t, but had always wanted a definitive catalogue of his work—and Bennett stuck to his word. 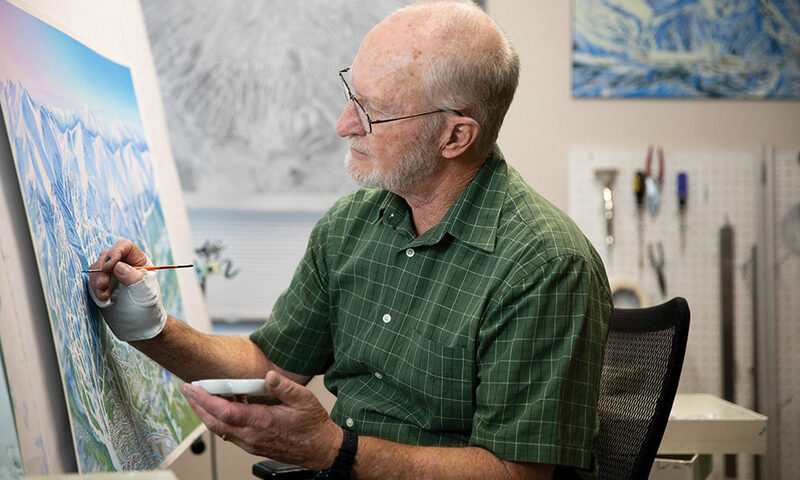 Bennett and Farrow launched a Kickstarter campaign in November 2018 for a hardcover book project, entitled James Niehues: The Man Behind The Map, featuring nearly 200 pieces of Niehues’ work, information on the artist’s method and the history of ski map-making. Within 24 hours of the campaign launching, they’d exceeded its goal 5 times over, and by its completion, had raised an astronomical sum, making it the No.1 art illustration Kickstarter campaign of all time. The book is scheduled to ship in June 2019. As I write this, I’m gearing up for my first-ever ski trip out West, with that same group of friends from Sugarbush. We’re headed to the Canadian Rockies to ski at Revelstoke, and definitely going to need some help getting around. Guess who painted the trail map?